At the moment, Cromwell is the only fully-featured execution engine that we know of that supports WDL. Cromwell is an open source (BSD 3-clause) execution engine written in Java that supports running WDL on three types of platform: local machine (e.g. your laptop), a local cluster/compute farm accessed via a job scheduler (e.g. GridEngine) or a cloud platform (e.g. Google Cloud or Amazon AWS). 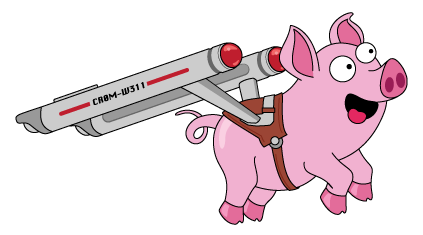 It is named after James Cromwell, the American actor and star of such great movies as Babe and Star Trek: First Contact -- hence its mascot, Jamie the warp pig. The Cromwell executable is available as a pre-compiled jar file from the Cromwell GitHub repository. It requires Java 8 to run. More detailed examples of running WDLs via Cromwell are available in the Tutorials section of the WDL documentation. This will run your workflow. You will see text from the Cromwell engine updating you as it walks through the steps. Note that any messages that are normally output to the terminal by the tools themselves will not actually be shown in the terminal where you're running the script. Instead, Cromwell saves this output in a log file called stderr located within the execution folder. Running on a cluster or cloud platform can be a little more complicated than that, so we don't cover them in this quick-start guide. We provide some pointers to platforms or integrations that wrap Cromwell on the Toolkit page. And that's it! Now you're ready to write some scripts yourself, so head on over to the Tutorials section.